Cleaning prefinished hardwood floors is easy and simple. The simplest way to clean them will be discussed in this article. There are many ways for cleaning prefinished hardwood floors but we will address a method that is lower in cost and limits the amount of cleaning supplies to clean them. This discussion is geared toward the residential homeowner. There are some important precautions to take when cleaning prefinished hardwood floors but the most critical is never over wet the hardwood floor. Wood hates water and can cause irreversible damage to the wood floor. So the least amount of cleaning solution used when cleaning prefinished hardwood floors the better. This is true for prefinished hardwood floors. Unfinished hardwood floors should never be cleaned with water based cleaners or water. 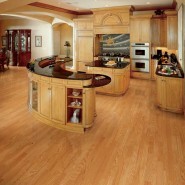 So the suggested cleaning method is simple, fast and uses the least amount of water and cleaner to clean the wood floor. This will limit the chance of water damage to the wood floor. For a list of additional precautions please refer to a prior article that addresses them and can be reviewed by clinking on the following link (Cleaning Hardwood Floors Do’s and Don’ts). Removing Loose Soil: Dust mop floor with untreated dust mop to remove most of the surface dust. Remove gum and other debris adhered to the floor with a Blunt Plastic Scraper being sure not to over scrape or apply to much pressure that may damage the finish of the wood. We also recommend using an upright dry vacuum to vacuum the dust and loose debris from the wood floor as an alternative to dust mopping the wood floor. Remove Black Marks: Use a with light duty white pad or tennis ball to gently rub out the black marks and scuff marks. Cleaning the Attached Soils: Using a microfiber flat mop cleaning system like Swiffer or Bona, for cleaning prefinished hardwood floors manually. With this type of cleaning mop systems, they are sprayed on to the floor directly. So be sure not to over wet but they are designed with limited amounts of cleaning solution and can also be used to spot clean stains and spots. Be sure to read the directions of the mop system before using on the floor. Allow floor to dry completely before allowing foot traffic on the floor.